Our Assessment Dog today was Finn. 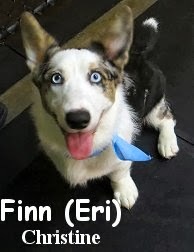 He is a fun-loving, four month old, twenty pound, Cardigan Welsh Corgi. Finn headed on over to the Medium Roll, where he absolutely flourished! He had thought that he had died, and gone to "Doggy Heaven" lol. Finn thoroughly enjoyed practicing his social skills here today. Luckily for him, there was a plethora, of perfectly matched dogs, for him to practice with. Finn made several new canine friends, having a most terrific stay. Good on ya Finn! We have a feeling we'll be seeing you again soon. For now, you can relive your fun, and dog filled moments from today, in the following clips. Here is Finn wrestling with Blue and Jackson. In this one, Finn is sprinting about with the wily Max.